Phew...that's a tongue-twister of a title...especially for what is basically a VERY simple chicken dish. It is, however, packed with great flavor and ranks right up there with the best of "comfort" foods. I mean who wouldn't qualify creamy, cheesy polenta as pure comfort?? Though easy (it uses only a handful of ingredients), quick (30 minutes tops), and flavorful, this dish is pretty enough (and "delish" enough) for company. Depending on your preference in peppers (I like all of them! ), you can pick and choose to your liking...using all of one type or a mixture of red, orange, green and/or yellow. I use Bob's Red Mill Organic Corn Grits (Polenta). The package directions will advise you on how to cook your grits if you are looking for a firm polenta that you can mold and cut into portions. Basically I follow the portions for water, salt and grits as noted on the packaging and then just cook it to a nice "mashed-potato-like" consistency, which happens pretty quick. 1. Whisk 5 tablespoons olive oil, lime juice, cilantro, and coriander in a bowl. Season dressing with salt and pepper. 2. Heat remaining 2 tablespoons oil in a non-stick skillet over medium heat. Sprinkle chicken with salt and pepper. Add to skillet and saute' until brown on one side (about 5 minutes). Turn chicken over and reduce heat to medium-low and cover. Cook for another 5 minutes, until cooked through. Transfer to platter and cover. 3. Return skillet to medium-high heat. Add peppers and onion to same skillet and season with salt and pepper. Toss until tender and just beginning to color (about 5 to 6 minutes). Mix in chilies and 2 tablespoons dressing and warm through. Remove pepper mixture from heat. Set remaining dressing aside. 4. In a separate pan, boil water for polenta, add salt and grits and cook over medium heat, stirring often until thickened ("mashed-potato-like"), about 10-15 minutes. Add shredded parmesan and stir until mixed through. 5. 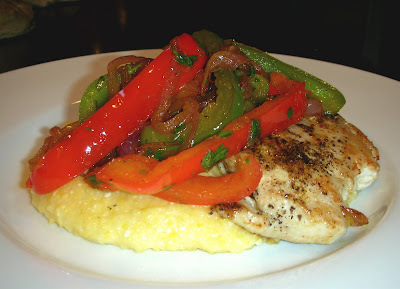 Place a spoonful of polenta on each serving plate, top each with a chicken breast and some of the pepper mixture. Drizzle a bit more dressing over all and serve.